Hi,Thank you friends and viewers. 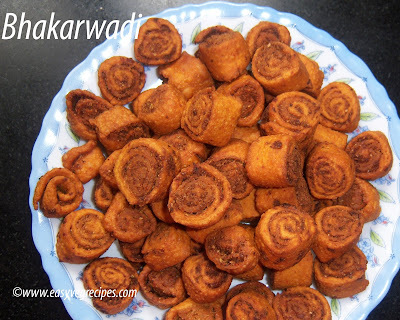 Today I will post how to make bhakarwadi recipe. Bhakarwadi is a traditional spicy Maharashtrian dish. This can be stored for more than two weeks. But it needs a lot of patience and effort to make them. They take very long time to make them. A Very interesting dish can be enjoyed with a hot cup of tea anytime. This dish I made long back. While I was watching old photos from my cam I found them. So thought of sharing the recipe with my friends. Hope you all like it and try to make it at home. All the best to you all and once you tried, let me know how they come up. Thank you all once again. In a wide bowl, crumble by adding oil to flours, salt, turmeric powder, asafoetida and red chilli powder. Mix them well. Add little water and make stiff dough. Allow this dough for 10 minutes. in a blender jar add fennel seeds, coriander seeds, sesame seeds, poppy seeds, cumin seeds, coconut, pepper corns, aamchur powder and sugar. Blend them and make coarse powder. Add one tablespoon of besan to the above powder. Meanwhile, divide the dough into equal portions. Roll it into a thin roti. Spread the masala evenly on top of it. Now slowly but firmly wind the roti. By now oil is also hot enough to fry them, so slowly drop them in the hot oil. Fry them in low to medium heat. Fry them till they turn light golden color. Off from the oil drain on kitchen napkin. Serve bhakarwadi any time with tea or without tea.